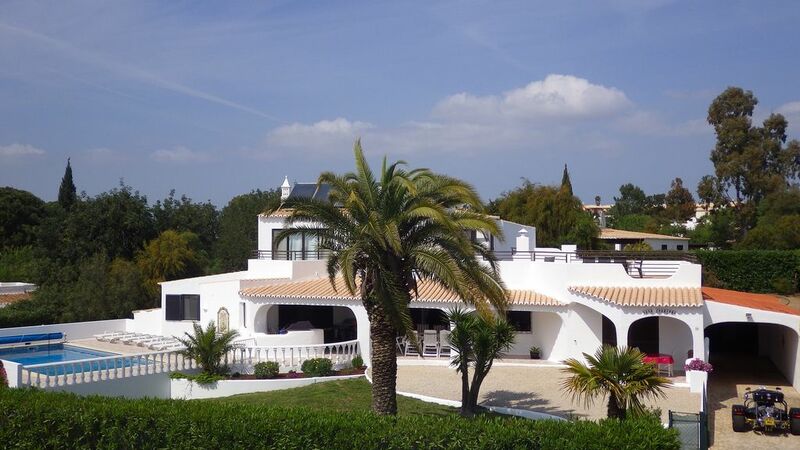 Casa Joaninha is a spacious 4 bedroom, 3 bathroom villa with its own heated pool and large roof terrace with sea views. The villa is located within 15 minutes walk from Carvoeiro centre on the edge of Quinta do Paraiso. The villa has air-conditioning in the bedrooms and wi-fi internet access. There are two separate lounges, one on the ground floor and other on the first floor opening to the large roof terrace. Please NOTE: the upstairs lounge is being converted into a 5th bedroom en-suite and the works will be completed in mid-May. The gardens are well maintained and there is a lawn area for children to play. Pestana Golf complex, with two 18 hole courses and Carvoeiro Tennis Club are only 5 minutes drive away. Carvoeiro itself is an old fishing village which has grown into a small residential seaside town with a lot to offer: beaches, restaurants, bars, shops and different outdoors activities and sports, all without high-risers or big apartment blocks. The kitchen is modern and fully equipped including dishwasher, fridge/freezer, cooker, microwave etc. There is also a washing machine available for the guests. Carvoeiro Tennis Club 2min drive away. Pestana Golf Complex, with two 18 hole courses, and Vale de Milho 9-hole Par3 course are both 5mins drive. Several other courses within 20-30min drive inc Penina Championship course, Palmares, Morgado (36-holes) and the new Pestana Euro Golf in Silves. Cot and highchair available free of charge. No smoking inside the villa. Security alarm. Outside: The pool (10 x 5m) has a shallow end for children and can be heated for an extra cost. 8 sunbeds and mattresses are provided. Child gates to the pool. The large roof terrace with sea views. The villa has a mature garden which is surrounded by hedge and fully fenced. There is a large car port for off-road parking for a maximum of 3 cars and electric gates to the road. Cleaning / Towels / Linen / Maid service: Quality bedlinen and towels provided including separate pool/beach towels. Maid service includes mid-week clean. The villa is wonderful with large, spacious rooms and grounds. The kids loved playing in the gardens and in the pool. Just a 10 minute walk from Carvoeiro centre and beach with plenty of bars and restaurants. The eight of us had a wonderful time with special thanks to Sam throughout the whole booking, build up and stay !! Thank you for your fantastic review which is greatly appreciated. It is always rewarding to know that guests have enjoyed their stay. Obviously it would be our pleasure to welcome you again at Casa Joaninha or any other villa that I manage in the area. We had a brilliant time at Casa Joaninha. Our group was 6 adults and 2 small children, the villa was perfect for us as the two double bedrooms are very large so there was more than enough space for cots and other baby equipment. The layout of the villa is great, there are several areas to sit and eat outside, including the upstairs roof terrace with barbecue which was fantastic in the evenings. The pool was perfect for our group, especially as it has steps which make it much easier and safer for the children, as well as a gate. The host was superb too, she ensured that we had everything we needed and even provided a few drinks and snacks for us upon arrival. All in all we couldn't find any fault with our stay and would highly recommend it to others looking for a family holiday in the Algarve. Thank you for your review which is much appreciated. It is fantastic to hear that you and the family enjoyed your stay and I look forward to welcoming you again at Casa Joaninha or at any other of my villas. Very well equipped, nice walks to restaurants - within fifteen minutes walk to the beach and centre of town. Helpful mamager and excellent cleaning staff of villa and pool. We would definately go again. This villa has everything. Spacious air conditioned rooms, large lounge with TV plus additional lounge on the first floor. Large terraces, heated pool, BBQ, washing machine, dishwasher and, as a self-employed web developer, solid wifi for that spot of work late in the evening (and some Netflix for the children). The villa is set within the Quinta do Paraiso resort and their reception, bar/restaurant, pool and mini-market are a stones throw. Both Carvoeiro beaches are within short walking distance too, just 15 mins to the main beach. As for Sam, the villa manager, very accommodating, had the fridge filled with some basics for eating after our late night flight arrival. We are a family of 6. Our kids are 9, 8, 4, 3 and they've had a blast, my in-laws also joined us during our last week and things didn't feel cramped. I'd have no hesitation in booking this villa again or indeed any other that Sam manages. Thanks for making our holiday great. Nous avons passé un très bon séjour dans une maison idéalement placé pour accéder aux commodités (plage, commerce et restaurant ). Les prestations accordées dans le cadre à location sont top (ménage en cours de séjour, accueil, literie et équipement...).. Thank you for your review which is greatly appreciated. Nice to hear you enjoyed your stay and the villa, and we hope that you, Jerome and the families will return in not-so-distance future. Carvoeiro Tennis Club with 13 courts and a gym near-by. Jeep safaris, a day out on quad bikes, scuba diving, wind surfing, deep sea fishing, dolphin watching, cycling, hiking, yoga, Pilate's. The nearest beach is 10min walk. Faro airport is 45 minutes or Lisbon airport is 2.5 hours. Sevilla airport in Spain also 2.5h drive. Car hire is not essential and pick up from the airport can be arranged on request. Off road parking for a maximum of 3 cars. Rates are per property per week in Euros. 200€ (or GBP200) refundable breakage deposit is requested prior to arrival. Pool heating charge 150€/wk and payable at the property. Change-over day Saturday in the main season, other times flexible.